Description: Sherlock Holmes's sister, Enola, is back on another case! Enola Holmes is being hunted by the world's most famous detective -- her own brother, Sherlock Holmes. But while she is on the run in the world's biggest, darkest, dirtiest city, she discovers a hidden cache of charcoal drawings and feels as if she is a soul mate to the girl who drew them. But that girl, Lady Cecily, has disappeared without a trace. Braving the midnight streets, Enola must unravel the clues to find this left-handed lady, but in order to save her, Enola risks revealing more than she should. Will she be able to keep her identity a secret and find Lady Cecily, or will the one thing she is trying to save -- her freedom -- be lost forever? My Thoughts: The Enola Holmes series are wonderful historical mysteries. Enola is the younger sister of Sherlock and Mycroft and has run away to London to avoid the fate of gently-bred young women in Victorian times. She has no desire to be an ornament to some deserving man and spend her day doing feminine things. She was raised by her mother to be independent and now at age fourteen is on her own in London. Enola's second case has her looking into the disappearance of another gently-bred young woman. Lady Cecily has disappeared from her home. Her mother and father suspect that she has eloped with a very unsuitable young man who is a clerk in a department store. Enola looks into Lady Cecily's life and discovers that she has a secret life too. Despite the outward appearance of a perfect Victorian young lady, Enola discovers some hidden charcoal drawings that show Cecily is quite interested in social justice. Enola seeks out Lady Cecily's clerk to see if he knows where she is. Meanwhile, her brother Sherlock is doing his own search for the missing Enola. 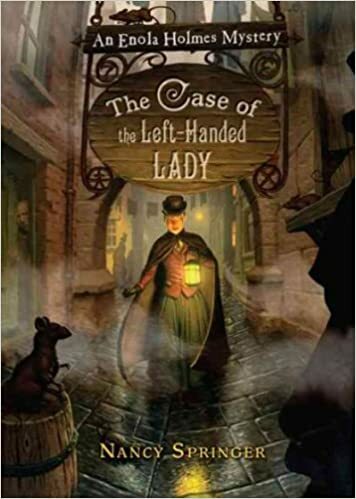 The story has wonderful descriptions of Victorian London and the life demanded of a young woman of Enola's class. It also has codes, a mystery, and a heroine who is determined to make her own choices but still filled with an aching loneliness and sense of abandonment. When the urge to sketch seized me, I could have drawn Ivy Meshle if I wanted to, or Mum, or Sherlock or Mycroft, or just about anyone I knew except Enola Holmes. My true self I could not quite capture on paper. Odd.